Measles activity has spiked in our neighboring counties. 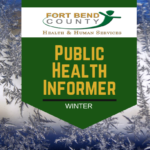 As of today, no confirmed cases of measles have been reported to the health department, Fort Bend County Health & Human Services. Individuals should protect themselves through vaccination. Vaccination is best way to provide protection against measles and other diseases. Measles can be serious, especially for young children and anyone who is not protected against measles. It is so contagious that if one person has it, 90% of the people around him or her will also become infected if they are not protected. Measles spreads through the air when an infected person coughs or sneezes. It starts with a fever, and then it causes a cough, runny nose, and red eyes. Then a rash of tiny, red spots breaks out. It starts at the head and spreads to the rest of the body. Measles can lead to pneumonia, encephalitis (swelling of the brain), and death. Fort Bend County Health & Human Services will continue to monitor the nation, state, and region-wide spike of measles. For more information on measles, visit the Centers for Disease Control and Prevention or speak to your primary health care provider.